We were situated at Warneet, Victoria, overlooking Rutherford Inlet, French, Quail & Chinaman's Islands on Westernport for 29 years. But suburbia caught up with us, well it started in ernest when the dirt road was sealed until we found that the village (of reclusives!) atmosphere that we moved to was disappearing. So now we have embarked on a tree change with 15 acres North of Benalla on the Broken Creek. The business is run by Peter and Carole Lewis in a factory on our farm. I have been a qualified book binder since 1991. I was employed for 10 years in the trade before completing my adult apprenticeship and for the 5 years prior I was involved and continue in Saddlery, so have an intimate, working knowledge with various leathers. SOLANDER boxes are top of the range in long term storage. Made from Marine grade plywood. Sealed and lined with up to 500 year woodfree paper. All units are handmade. 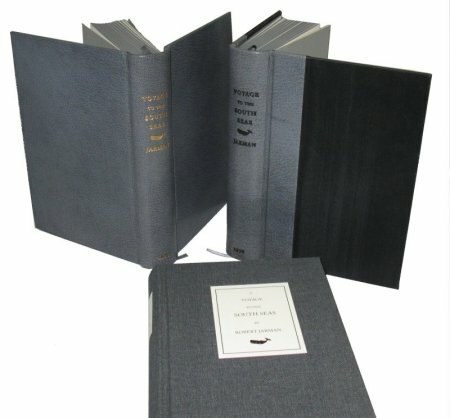 We can provide a full book binding service for your family history, travel journals, thesis, newspapers & photo albums. Items include books and boxes in a variety of book cloths and leathers or imitation finish. We have a range of Brass Handset type & Decorative Rolls and a Ludlow for lead casting of type faces for blind, foil or Gold debossing. Magnesium Blocks for logos can be arranged usually within 24 hours (with suitable artwork). Archival Solander & Lipped Clamshell Boxes designed for your requirements, made to order & shipped Australia wide. We can undertake a range of repairs to cloth & leather books and objects. We use & recommend S-1805 EVA adhesive (Developed, PAT certified & made in Aust).